The president of the American Federation of State, County and Municipal Employees says it “has a score to settle” with Gov. Scott Walker. Lee Saunders told the Washington Post that AFSCME is organizing an intense effort to prevent the Republican governor from winning a second four-year term. The fight over Gov. Walker’s signature legislation, Act 10, led to weeks of protests and put Wisconsin in the national spotlight. 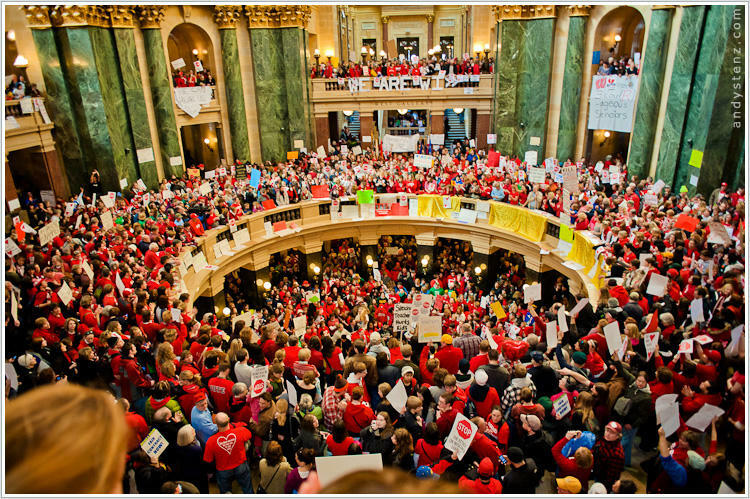 Walker’s signature legislation is Act 10, the law that eliminated most collective bargaining rights for nearly all public workers. Walker argued the change was needed, so governmental units could better control tight budgets. Public sector unions accused Walker of union-busting, and said Act 10 took away their constitutional rights to bargain collectively. Courts have rejected that argument. The law also ended public sector unions’ practice of deducting dues from members’ paychecks. Saunders told the Washington Post the changes have cost AFSCME 70 percent of its membership in Wisconsin. Saunders says AFSCME will push for Walker’s ouster, while the union also gets behind Democratic candidates for governor in four other states – in hopes of preventing a GOP winner from enacting legislation, such as Act 10. Walker’s campaign spokeswoman says Saunders’ comments show that “union bosses are bitter” and they’ll “stop at nothing” to defeat Walker. Walker’s opponent, Democrat Mary Burke, did not comment on Saunders’ remarks. After the partisan primaries last month, UW-Green Bay professor emeritus Michael Kraft predicted special interest groups from around the country would invest in the campaign for governor, believing they have a big stake in what happens in Wisconsin. “A lot of groups look at a state like Wisconsin and think it’s worth defending their position -- or turning matters around politically -- because it does signal something about the relative power in the country. If conservative forces can keep the governor in office, for example, that may have effects on other states and on the presidential election in 2016. And obviously in Gov. Walker’s case, if he wins reelection, and particularly if he does so by a solid margin, I think most people believe he will be a serious candidate for the Republican nomination for president in 2016. So that alone is reason for out of state groups to come in and spend a lot of money, and they clearly did in the recall election – vast amounts of money – and we may well equal that this year,” Kraft said.